VWs self-driving shuttle will use features seen in the Budd-e concept, pictured. Volkswagen’s ride-sharing autonomous vehicle will borrow ideas from the Budd-e concept but will not be exactly like it. VW’s new Moia digital business division is developing an electric people mover that will be used by a ride-sharing service to challenge Uber. What will this vehicle look like and how will Moia’s shuttle ride-sharing service work? VW is expected to reveal more details when the automaker debuts an electric minivan concept at the Detroit auto show on January 9. The EV will have six to eight seats, so will be more like minibus versions of VW’s Transporter light van than a car. Indeed, Moia in Europe is likely to use the Transporter until the vehicle arrives, Thomas Sedran, VW’s head of group strategy, told Automotive News Europe. Moia’s ultimate goal is to run the vehicle without a driver and it expects to be running autonomous prototypes by 2019, Moia CEO Ole Harms said. The vehicle itself is expected by then, but we’re likely to see a concept in 2017, Harms said. 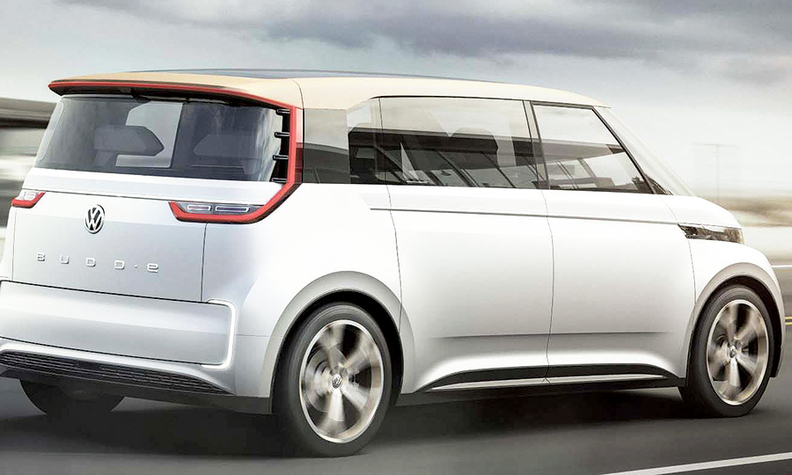 The vehicle will be a little different from the electric Budd-e minivan concept unveiled by VW at the 2016 Consumer Electronics Show in Las Vegas, but it will use some of its ideas, including always-on wireless internet connection, Harms said. Sedran said that VW is anticipating driverless versions of the vehicle by experimenting with a special windscreen that can show films or commercials but also revert back to transparency if it needs to. VW plans to pilot on-demand shuttle services next year through Moia, initially using existing VW Group vehicles that are not autonomous vehicles. The plan is that customers will be able to hail the shuttle via an app, then move to the nearest main street that the shuttle will be operating on. VW’s idea is that Moia will fit halfway between a taxi and a bus, meaning it will run along busier routes but stop where you need it to. If there is no Moia vehicle available, then the VW could auction off your business to another ride-share company. VW is insistent that it forms a solid relationship with local authorities before setting up in a town or city. By doing that it hopes to identify areas of weakness in the local public transport network and plug that gap. It says Hamburg, where it has agreed a three-year strategic mobility partnership for urban mobility, will be an important location. The German government sees Hamburg as a possible test field for autonomous driving. The findings from the Hamburg partnership will be incorporated in future Moia projects in Europe, VW says.